Various orthopedic implants are required during injuries for bones and joints. Injuries occur due to sports, accidents, diseases, etc.. Availability of veterinary implants and joint replacement for the treatment of various diseases and injuries among companion animals is highly valued by pet owners. Pet owners across the globe spend billions of dollars every year for the diagnosis and treatment of diseases affecting their beloved pets. Increase in expenditure on animal health is expected to boost market growth in the next few years. The global veterinary orthopedic implant market was valued at US$ 86.3 Mn in 2017. It is projected to expand at a CAGR of 7.1% from 2018 to 2026. The global veterinary orthopedic implant market has been segmented based on product type, end-user, and region. In terms of product type, the global market has been classified into veterinary plates & screws, joint replacement implants, and others. The joint replacement implants segment has been further classified into hip replacement implants, knee replacement implants, and others. The veterinary plates & screws segment is anticipated to account for a leading share of the global market during the forecast period, owing to high consumption of these veterinary plates & screws during veterinary orthopedic processes. In terms of end-user, the global market has been bifurcated into veterinary hospitals & clinics and research institutes. The veterinary hospitals & clinics segment is expected to account for a significant share of the global market during the forecast period, due to a rise in the number of private clinical practices. 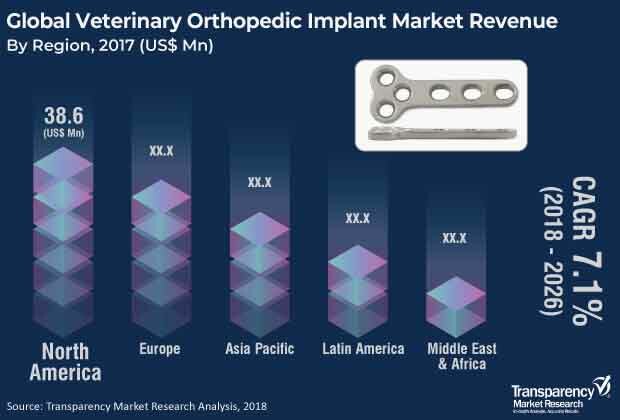 In terms of region, the global veterinary orthopedic implant market has been segmented into North America, Europe, Asia Pacific, Latin America, and Middle East & Africa. North America and Europe accounted for a major share of the global market in 2017. High pet ownership and increase in spending on animal health drive the veterinary orthopedic implant market in these regions. The market in Asia Pacific is likely to expand at a significant CAGR during the forecast period. Rise in the population of livestock animals and increase in pet adoption are projected to propel the market in the region in the next few years. Key players operating in the global veterinary orthopedic implant market include B. Braun Melsungen AG, Johnson & Johnson, Veterinary Orthopedic Implants, Inc., BioMedtrix, LLC, KYON Veterinary Surgical Products, IMEX Veterinary, Inc., Orthomed (UK) Ltd, and Securos Surgical. These companies have a broad product portfolio of veterinary orthopedic implants along with a strong distribution system across the globe. This report analyzes the current and future scenario of the global veterinary orthopedic implant market. Increase in the number of companion animals, rise in R&D expenditure on animal health, and rise in demand for veterinary practitioners are the major drivers of the global market. The global veterinary orthopedic implant market report comprises an elaborate executive summary, which includes a snapshot that provides information about various segments of the market. It also provides information and data analysis of the global market with respect to segments based on product, end-user, and region. A detailed qualitative analysis of drivers and restraints of the market and opportunities has been provided in the overview section. Additionally, the section comprises a competitive matrix and company profiles with products portfolio to understand the competitive landscape in the market. This section of the report also provides market attractiveness analysis, by region, and market position analysis, by key players, thereby presenting a thorough analysis of the overall competitive scenario in the global veterinary orthopedic implant market. The global veterinary orthopedic implant market has been segmented based on product, end-user, and region. In terms of product, the global market has been divided into veterinary plates & screws, joint replacement implants, and others. The joint replacement implants segment has been further classified into hip replacement implants, knee replacement implants, and others. In terms of end-user, the global veterinary orthopedic implant market has been divided into veterinary hospitals & clinics and research institutes. The market size and forecast for each of these segments have been provided for the period from 2016 to 2026, along with their respective CAGRs for the forecast period from 2018 to 2026, considering 2017 as the base year. The global veterinary orthopedic implant market has been segmented into five major regions: North America (the U.S. and Canada), Europe (the U.K., Germany, France, Spain, Italy, and Rest of Europe), Asia Pacific (India, China, Japan, Australia & New Zealand, and Rest of Asia Pacific), Latin America (Brazil, Mexico, and Rest of Latin America), and Middle East & Africa (GCC Countries, South Africa and Rest of Middle East & Africa). The market size and forecast for each of these regions and countries/sub-regions have been provided for the period from 2016 to 2026, along with their respective CAGRs for the forecast period from 2018 to 2026, considering 2017 as the base year. The research study also covers the competitive scenario in these regions. The report also profiles major players in the global veterinary orthopedic implant market based on various attributes such as company overview, financial overview, product portfolio, business strategies, and recent developments. Major companies profiled in the report are B. Braun Melsungen AG, Johnson & Johnson, Veterinary Orthopedic Implants, Inc., BioMedtrix, LLC, KYON Veterinary Surgical Products, IMEX Veterinary, Inc., Orthomed (UK) Ltd, and Securos Surgical.